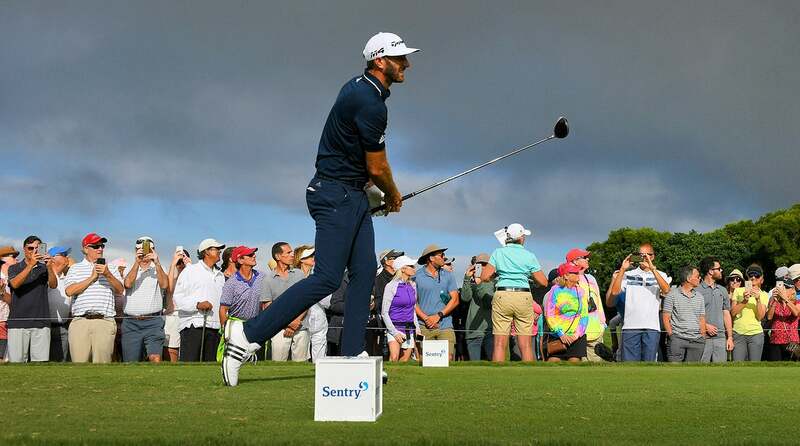 KAPALUA, Hawaii -- A new year brought out the best in Dustin Johnson, who powered his way to an 8-under 65 and an eight-shot victory Sunday in the Sentry Tournament of Champions. In a field that featured the top five players in the world, Johnson made a strong opening statement that the No. 1 ranking he has held for nearly a year might be difficult to take away. He finished at 24-under 268. The eight-shot margin of victory was his largest ever, and it was one short of the tournament record set by David Duval since this event moved to Kapalua in 1999. Jordan Spieth also won by eight shots in 2016. Jon Rahm made his Kapalua debut by closing with a 69 to finish second. The 23-year-old from Spain moved to No. 3 in the world. The way Johnson was playing, everyone was playing for second. "It's no easy task,'' said Rahm, who lost to Johnson in the final of Match Play a year ago. Johnson won for the 17th time on the PGA Tour, and the fifth time dating to the Genesis Open at Riviera last February. He has 11 straight seasons winning at least one tournament, the longest current streak on the PGA Tour. He lost a six-shot lead in the final round of the HSBC Champions in Shanghai last fall, his most recent PGA Tour start. It only crossed his mind when it was mentioned to him on Saturday. Johnson doesn't let much cross his mind. And then he produced another memorable round. He had a two-shot lead over Brian Harman, who struggled mightily with his speed on the greens and fell back quickly. Johnson effectively ended the tournament when he made three birdies on the opening six holes, saved par from a front bunker to a back pin on the par-3 eighth, and then birdied the par-5 ninth for a six-shot lead. One shot defined the tournament -- a drive on the 433-yard 12th hole that went 432 yards and 6 inches. Johnson, who on Saturday holed a 70-yard chip down the hill for eagle, ripped his drive, picked up his tee and walked away. It's a blind shot over the hill, with a strong wind at his back, so he never saw the ball race down the hill, onto the green and head straight to the cup until stopping 6 inches away. He played the 12th hole in four shots on the weekend. That stretched his lead to seven shots, and the rout was on. Johnson joined Stuart Appleby(three times) and Geoff Ogilvy(twice) as the only multiple winners at Kapalua. He also won in 2013 when it was shortened to 54 holes because of wind so strong the start of the tournament was delayed for three days. Harman closed with a 72 to finish third, while Hideki Matsuyama(66), Pat Perez (69) and Rickie Fowler (70) were another shot behind. Johnson went 66-65 on the weekend. He now takes a week off before going to the Abu Dhabi HSBC Championship against another strong field, this one on the European Tour. "I got off to a great start, and I want to keep it going,'' Johnson said. "Everything is going in the right direction."